“We are witnessing in the United States a new nativism, which the American Catholic community must reject and label for the religious bigotry which it is,” he said in a keynote address delivered Feb. 17 in the University of San Diego’s Joan B. Kroc Institute for Peace and Justice. 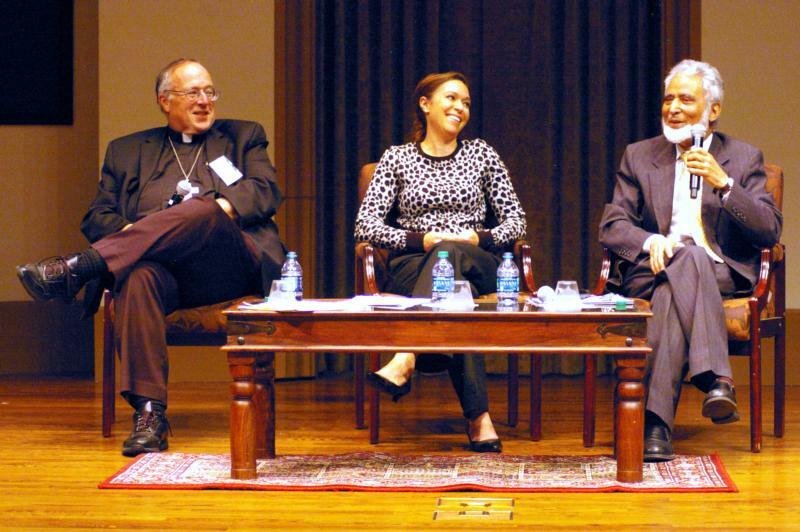 The evening event took place against the backdrop of the first national Catholic-Muslim dialogue, which was held Feb. 17-18 at the Catholic university. Last May, after more than 20 years of regional dialogues with representatives of the U.S. Muslim community, the Committee on Ecumenical and Interreligious Affairs of the U.S. Conference of Catholic Bishops established a national Catholic-Muslim dialogue. Motivated by the call of “Nostra Aetate,” the Second Vatican Council’s declaration on the relationship between the Catholic Church and non-Catholic faiths, the dialogue seeks to foster understanding and collaboration between Catholics and Muslims. Chicago Archbishop Blase J. Cupich has been named its first Catholic co-chairman. In addition to Bishop McElroy’s speech, the evening also featured a keynote speech by Sayyid M. Syeed, national director of the Islamic Society of North America’s Office for Interfaith and Community Alliances, who reflected on the state of Catholic-Muslim relations from the Muslim perspective. A discussion with both men was conducted on stage by Ami Carpenter, an associate professor at the Joan B. Kroc School of Peace Studies, with members of the audience invited to ask questions. In his remarks, Bishop McElroy exhorted Catholics “to recognize and confront the ugly tide of anti-Islamic bigotry” in the United States, to actively seek relationships with Muslims on a personal level, to accompany the Muslim community as it wrestles with religious liberty issues, and to join with them “to witness to and fight for” a Middle East where Christian, Muslim and Jewish communities can coexist peacefully. Bishop McElroy said U.S. Catholics should view with repugnance the “repeated falsehoods” that Islam is inherently violent, that Muslims seek to supplant the U.S. Constitution with sharia law, and that Muslim immigration threatens “the cultural identity of the American people.” Such claims, he said, are strikingly reminiscent of the anti-Catholic bigotry that was once prevalent in the United States. However, the bishop’s denunciation of prejudice does not signify a denial of the reality of terrorism. “I want to underscore that it is not bigotry to fear or to combat the violence and terror which some Muslims in the world have unleashed in the name of faith,” he explained, while acknowledging that some Christians also have attempted to use their faith to justify acts of violence. Bishop McElroy also challenged U.S. Catholics to overcome the “patterns of social segregation” that lead them to associate almost exclusively with people from similar backgrounds. Because of this trend, he said, many Americans do not have a significant friendship with a single member of the Muslim faith. Through such encounters, he said, Catholics may take inspiration from the rich spirituality of the Muslim people, which includes the centrality of daily prayer, a commitment to asceticism and an understanding of “the immensity and the richness” of divine mercy. He encouraged Catholics “to walk with the Muslim community” as it reflects upon issues of religious liberty and the relationship between church and state. Before concluding his presentation, Bishop McElroy issued one last challenge: Catholics and Muslims should work together toward a peaceful future and an end to religious conflict. Praising Islam’s respect for “the peoples of the Book” — its term for adherents of Judaism, Christianity and Islam, each of which trace their lineage back to the patriarch Abraham — the bishop acknowledged the fear and grief that has been caused by religious violence worldwide. He called it “a terrible wound to the Christian community” that Christians in the Middle East are facing “extinction” in a region that has been there home for more than a millennium, while it is “a great tragedy for the Muslim community” to see Muslim refugees denied safe haven in Europe. In his own keynote presentation, Syeed noted that the first millennium was marked by positive relations between Christianity and Islam, but that changed in the millennium that followed, which included the Crusades. But “a new era of understanding and recognition” dawned during the latter half of the 20th century, he said. “Nostra Aetate” was instrumental in bringing an end to “the millennium of confrontation between Islam and Christianity.” This improved relationship, he said, also has coincided with the emergence of a “vibrant Muslim community” in the West. Unfortunately, said Syeed, the Islamic State terrorist group has reintroduced “the terminology of (the) Crusades era.” It identifies Christians as “crusaders” rather “people of the Book.” The “antidote” to the Islamic State philosophy, he said, comes through robust Catholic-Muslim dialogue as well as the lived experience of Muslims in the West. He specifically cited his own organization, the Islamic Society of North America, whose members have lived peacefully among American Christians for more than 50 years. Living in a pluralistic society has encouraged American Muslims to re-examine the original sources of Islam and to reconsider some conventions that were adopted centuries later. For instance, while women are prohibited from driving cars in Saudi Arabia, Syeed explained, many American Muslims have taken a different view on the subject, citing Muhammad’s own exhortation that parents train their sons and daughters to be good camel-drivers and applying that directive to modern-day modes of transportation. “‘Nostra Aetate’ and the Islamic practices of American Muslims have thoroughly identified natural allies between the Abrahamic faiths and other religious communities,” he said. “This is the shape of a new millennium of alliance-building for common values of mutual respect and recognition. I agree with Josh. If these “dialogues” continue we will all be kneeling 5x a day facing Mecca. These useless Catholic leaders have watched with disinterest as the entire ancient Christian population of the Middle East has been ravaged by Muslims to the point of no return. They twiddle their thumbs as Christians from Egypt to Pakistan are burned, stabbed, beaten, raped and dispossessed by baying mobs led by imams on bullhorns and loudspeakers. I guess it is safer to sit on a smug interfaith panel and moan about “anti-islamic bigotry” than to actually defend their own brothers and sisters world-wide who are suffering unspeakable misery and devastation.